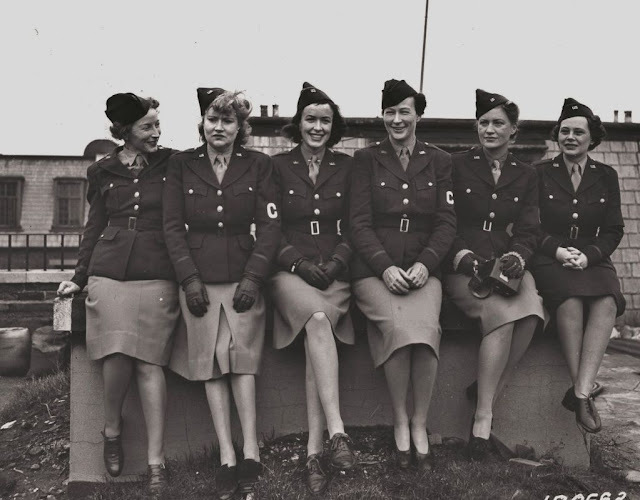 Because they don't get nearly enough credit and attention on sites like this, I am adding this page on Women of World War II. My aim, as always, is not to be comprehensive. Nobody can do that with a group as large as women. 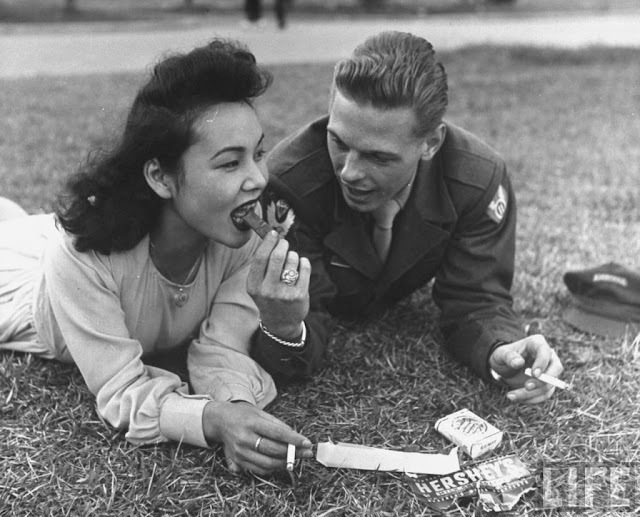 Instead, I aim to give a flavor of women's involvement, one way or another, with the war effort. The role of women in wartime is underestimated. They provide all the essential support services that keep the men fighting. 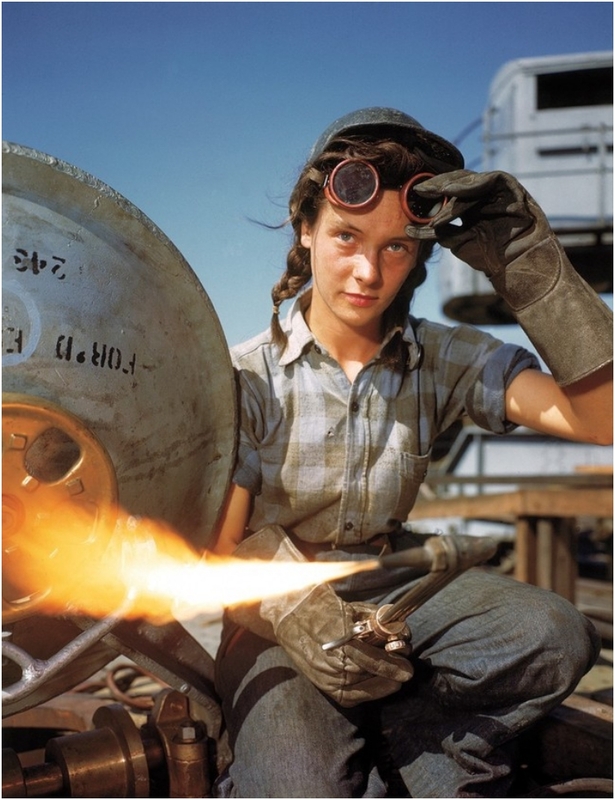 Without female support, no war effort is going to survive for long, much less prevail. Women truly are the backbone of any successful wartime effort. The opinions of women are not monolithic, and neither are their experiences. They are not all pacifist, or tender, or brutal, or anything. The experience of World War II proves for all time that women are aligned with the men of their culture, they just do different things. Not more or less important things - just different things. And, on occasion, the same things. Okay, enough chatter, let's have a go. "Ginni" (Pinterest/Leisa Shannon Art Studio). I don't know who "Ginni" is/was, or why she was in Australia (those are US military insignia). 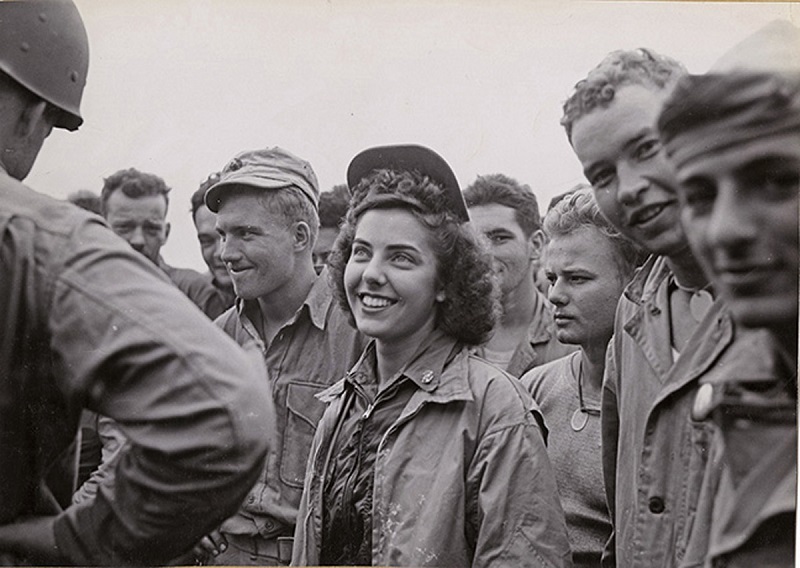 Maybe she was a USO performer (that is a very professional shot) or just visiting (military fashions were very "in" during the war). More likely, Ginni was there in an official capacity. My source says she was a nurse, but who knows. Just because she says she was in Australia doesn't mean she actually was, nurses were all across the Pacific and likely would not be able to reveal their real location for security reasons. Whatever else she was... Ginni was magnificent. 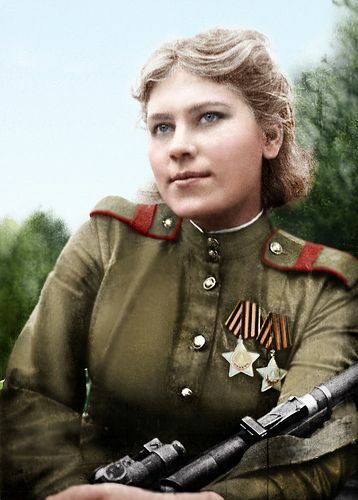 Roza Shanina was a sniper girl who served in the final two years of the war. 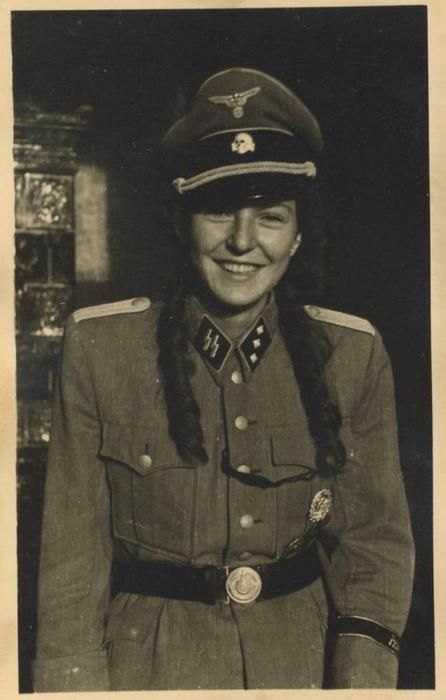 Unfortunately, she was killed in early 1945 in East Prussia after killing over 50 Germans. The top photo looks too perfect to be from the 1940s, but it is identified as authentic everywhere I look and, until I learn otherwise, that is how I will treat it. And before you righteously claim that it is "impossible" for the top photo to be genuine, I can point you to many Life Magazine photos of the time that were just as good or even better (in fact, see some below). Roza was a big propaganda heroine during the war and would have had the absolute best photographic equipment available for posed shots. Anyway, even if you just rely on the second photo, you have to admit that Roza was amazing. 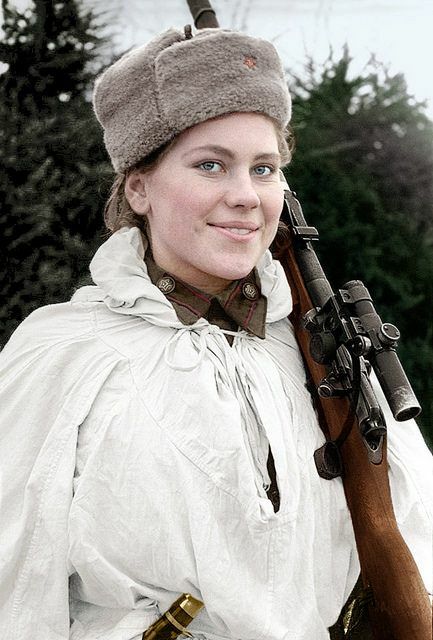 Kyra Petrovskaya also was a sniper girl, on the Leningrad front. Not only did she survive the war and later emigrate to the US, but she lived a full and successful life. Kyra passed away on June 3, 2018, in Kingston, Washington. Ilse Hirsch was a BDM Girl. She also was a committed Hitler loyalist who remained very supportive right to the end. 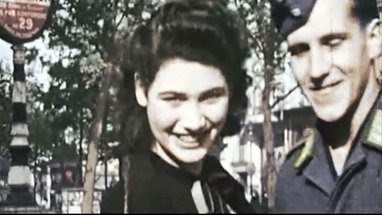 After being featured in propaganda early in the war as in the top picture, Ilse continued to prove her loyalty until chosen for Operation Carnival in 1945. After completing that assassination, Ilse limped home on a bum leg and waited for the Allies to arrest her. She died early in the 21st Century. It is my personal opinion, shared by nobody else, that Ilse Hirsch was the inspiration for the character of Dara in the infamous Star Trek episode "Patterns of Force." Women fully supported the Hitler regime, and many also were wildly enthusiastic supporters of Adolf Hitler personally. This is a bit of a solemn pose, but I still like this shot for its girl-next-door quality, earnest gaze, and the impeccable photography. 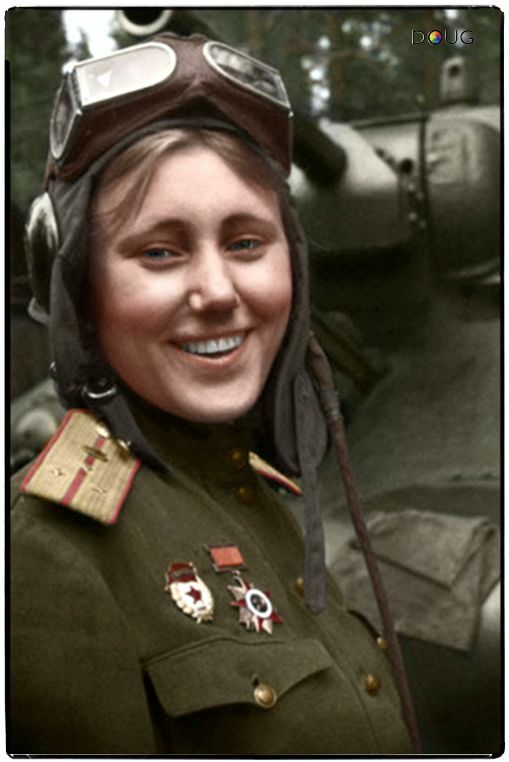 Maria Dolina was a member of the Night Witches, the legendary all-female Soviet bomber group. 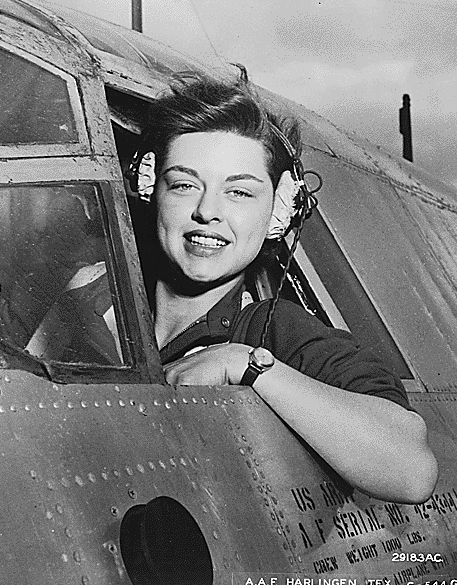 She flew seventy-two missions bombing enemy ammunition depots, strong-points, tanks, artillery batteries, rail and water transports, and supporting Soviet ground troops. The group flew old biplanes, and one of their objectives was simply to be annoying and deprive the front-line Wehrmacht troops of sleep. At this, they were extremely successful, thus earning their nickname from the Germans (and other epithets which you can well imagine). 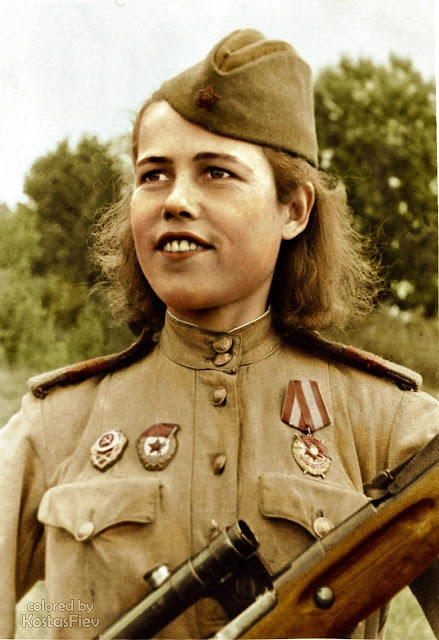 On August 18, 1945, Maria Dolina was awarded the title of the Hero of the Soviet Union, the highest honor anyone from the rank and file could receive. 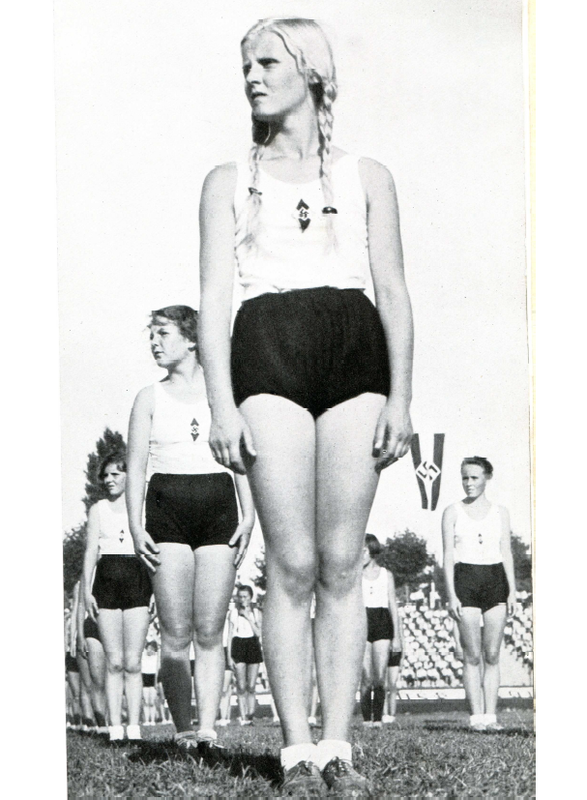 BDM girls were forced to become physically fit, and wear short-shorts in the process. This looks like some sort of party rally. I have no information on this young lady whatsoever. She is wearing an SS officer's uniform, but obviously, she was borrowing it from someone, perhaps her boyfriend or brother or, well, someone. Elsewhere on the Internet, she is identified as a "young girl," but she looks older than that to me. Whatever. Who, what, or when is unknown, but she represents the women who enthusiastically supported the SS and other extreme organizations. As a bonus, she apparently inspired a raft of Hollywood B-movies in the 1970s. 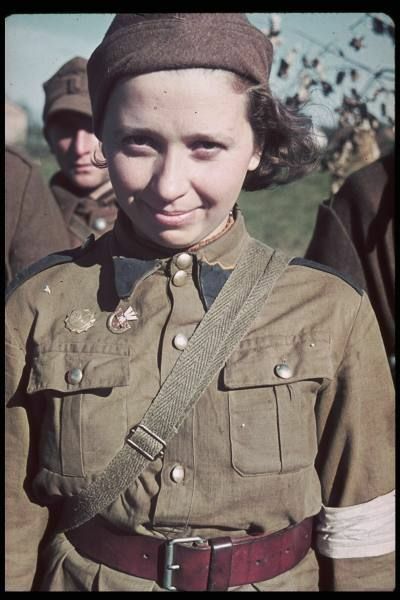 There were some women in the Soviet Red Army aside from snipers and Night Witches. 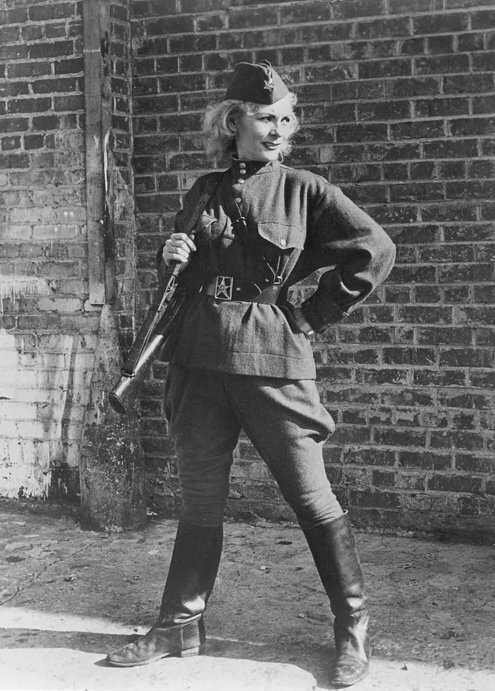 Lt. Aleksandra Samusenko, a Soviet Ukrainian commander of a T-34 tank and a liaison officer during World War II, was the only female tank-man/person in the 1st Guards Tank Army during 1943. I am cheating a bit here because this young lady did not (to my knowledge) participate in the war beyond living through it. In fact, this picture wasn't even taken during the war. This is from a Life Magazine spread showing the reality of the Japanese occupation published shortly after the war. Japanese women spent the conflict at home, facing gradually increasing privations. Many died in bombing raids, including nuclear explosions. It certainly seems right that a few should have had a little enjoyment afterward in the company of a dashing serviceman - even if it was against regulations. 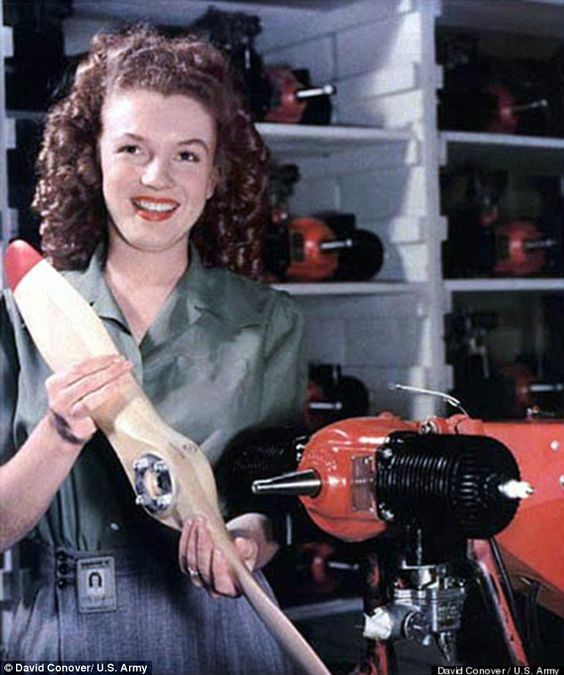 I include this shot just to honor all the lovely women who inspired plane nose art during the war. I have no idea who the happy lady was or what kind of plane that is. This was taken at the boneyard, and her days were numbered. But, she lives on here. Lyudmila Pavlichenko was another Soviet sniper girl during World War II. A student at the outbreak of the war like many other female snipers, Pavlichenko was among the first to volunteer for the armed forces when the Soviet Union was invaded. 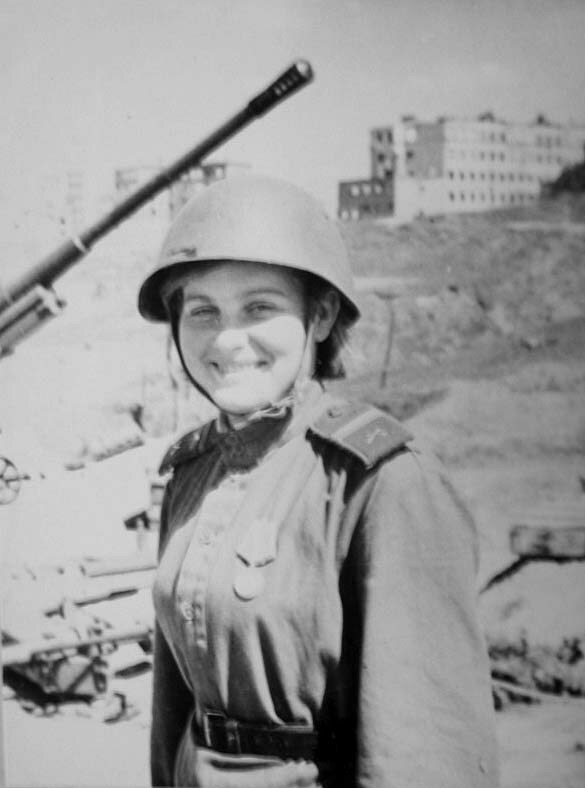 Rather than be a nurse, she chose to be a sniper and joined the 54th Infantry Regiment of the Red Army's 25th Rifle Division. 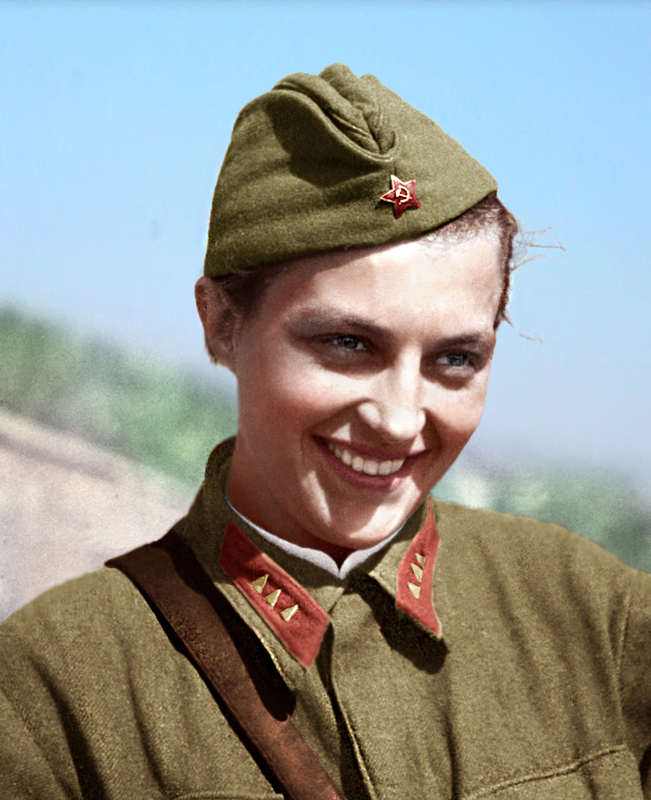 With 309 kills, Pavlichenko is the most successful female sniper in history and one of the top ten overall. She achieved them all quickly, in less than a year, and then was pulled from combat due to her growing fame. 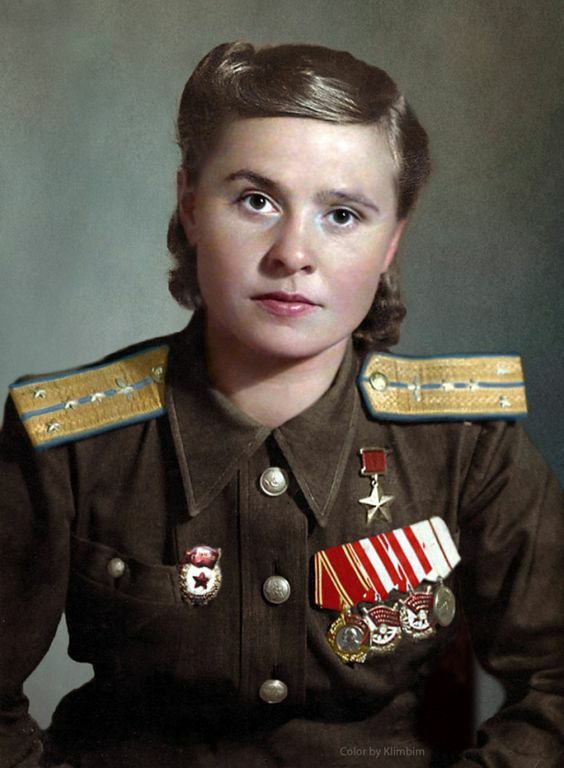 Lyudmila earned the highest of honors, Hero of the Soviet Union, and passed away in 1974 at age 58. Simone Segouin was known as Nicole Minet. 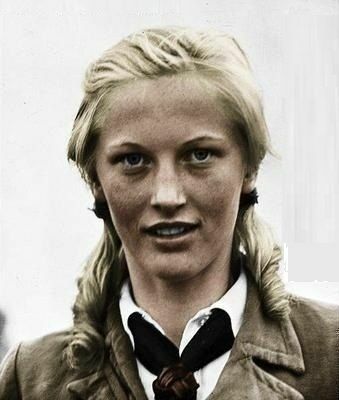 She was a French Resistance fighter who served in the Francs-Tireurs et Partisans group. 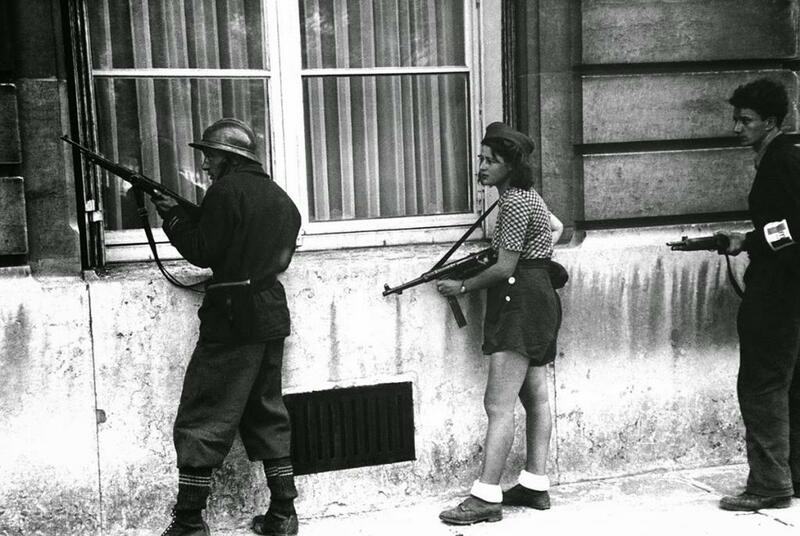 Simone reportedly killed several German snipers during the re-conquest of Paris in August 1944. It is rare to get a shot of a female partisan in action, and this looks fairly authentic for what the partisans actually did. The bottom shot is a US Red Cross recruiting poster. I don't know who the ladies pictured were modeled upon, but they certainly seem friendly. Hospital ships were everywhere during the war, clearly marked, but sometimes they were fired upon - hopefully by mistake. 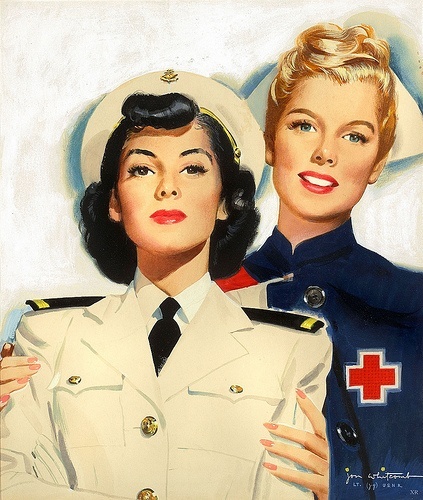 Since I showed some nurse posters, I might as well show an actual nurse or two. 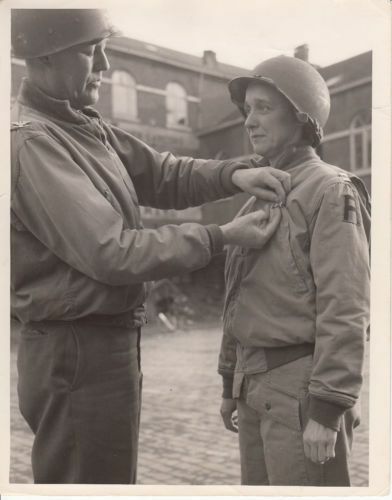 Here, US Army Nurse Corps Captain Anne Roebuck receives the Bronze Star for valor from a 1st Army Surgeon in Belgium, 18 November 1944. You can see how much it means to her. Jane Kendeigh (US Marine Corps photo). Of course, women in many countries were on battlefields, either as soldiers or simply because the war rolled over them. Women also, on occasion, were sent to battlefields with the US armed forces. Navy Ensign Jane Kendeigh was the first flight nurse to arrive on Iwo Jima while the battle was still raging. The men greatly appreciated her presence. Sniper Evdokia Motina served in the 21st Guards Rifle Division. She was another of the pert Soviet snipers of World War II who had no compunctions about killing fascists. 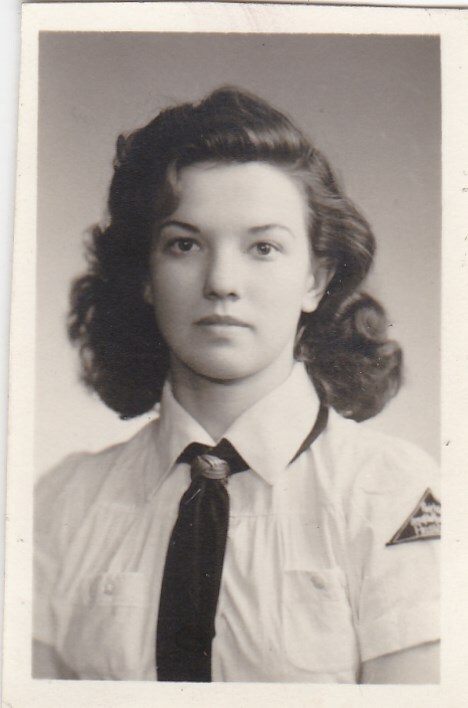 Evdokia served during the Nevel Offensive of 1943 which punched a hole through the northern section of the line which annoyed Hitler. 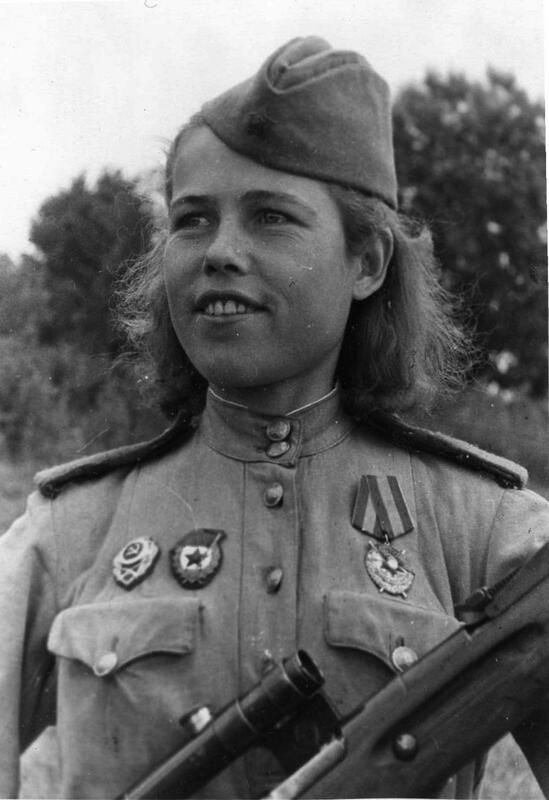 She won the Order of the Red Banner, which she displays in the above photo from 1944. This obviously is a propaganda shot taken during Operation Barbarossa. These Ukrainian girls are helping this young soldier out. This kind of scene was quite common across Europe. 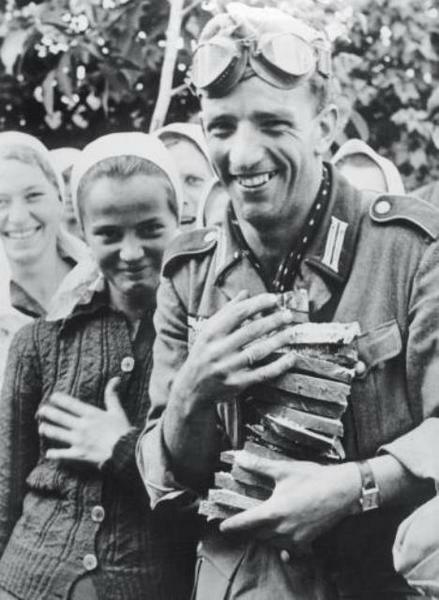 The Wehrmacht was seen as liberating countries - at least by some, at first. Warsaw, Poland, April 19, 1943. The Holocaust affected so many lives and ended many as well. 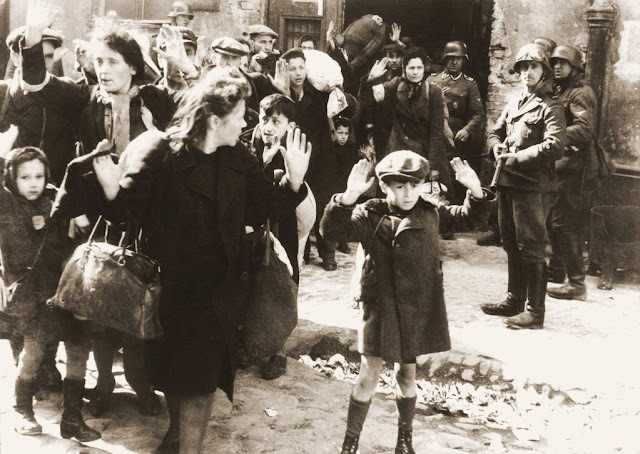 Jews, Catholic Poles, dissenters, and others were rounded up, sent to camps, and usually liquidated. The mistreatment of women, of course, extended far beyond just those who lost their lives at places like Ravensbruck. This is one area where women and men went through identical experiences. If you want more on this vast topic, you can visit my page here. Elizabeth Gardner ferried planes in Texas. Other than that... she had a pretty smile. Women were very important in freeing men for the front by taking on these mundane tasks. A Soviet sniper team in an obvious propaganda pose. For one thing, snipers usually hide in blinds or else they are spotted and get return fire, so sitting up like that is a huge no-no. However, this was for media consumption, and in that sense, this really works. 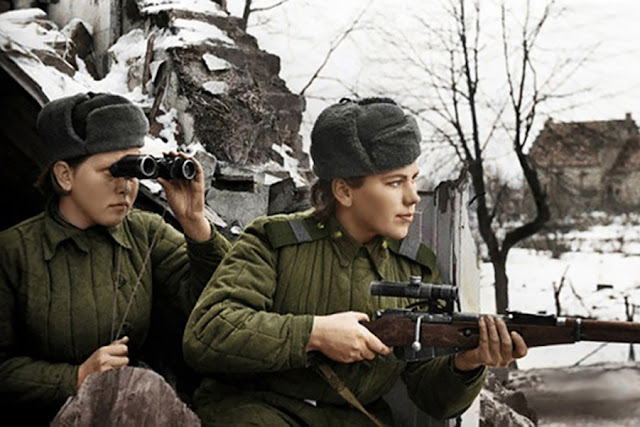 Super quality - for some reason, Soviet photos of sniper girls are top-notch. There were so many Soviet sniper girls that they deserve special attention. I did not know who these women were when I posted this photo. However, a helpful contributor in a comment below dug up a similar photo that identifies them as correspondents accredited by the US Army: Mary Welsh, Dixie Tighe, Kathleen Harriman, Helen Kirkpatrick, Lee Miller, and Tania Long. These women were the first female correspondents sent over after the invasion of Normandy. They were not wallflowers, and they did good work. They took some classic photographs of ruined French cities and went as close to the front lines as the authorities would allow. Several - or all - of them chafed at the restrictions placed upon them and wanted to do just what the male correspondents did. Some suffered from Post Traumatic Stress Syndrome (PTSD) long after the war was over. One also can imagine the effect these ladies had on the boys at the front when they came to visit. 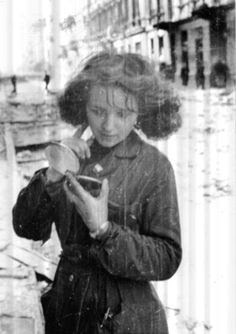 Even when you are a partisan fighting for your life during the Warsaw uprising in 1944, as is the woman above, there always is time to make yourself presentable. If you are going to die... go down with class. Above, a Polish nurse captured during the German invasion of Poland in 1939. These two shots above are of female factory workers during the war. They were picked out from their colleagues for Army promotional shots to help the war effort. They were not models or actresses, and nobody had heard of them before. The lady on the bottom, Marilyn Dougherty, became famous in later years in another profession and you may recognize her. 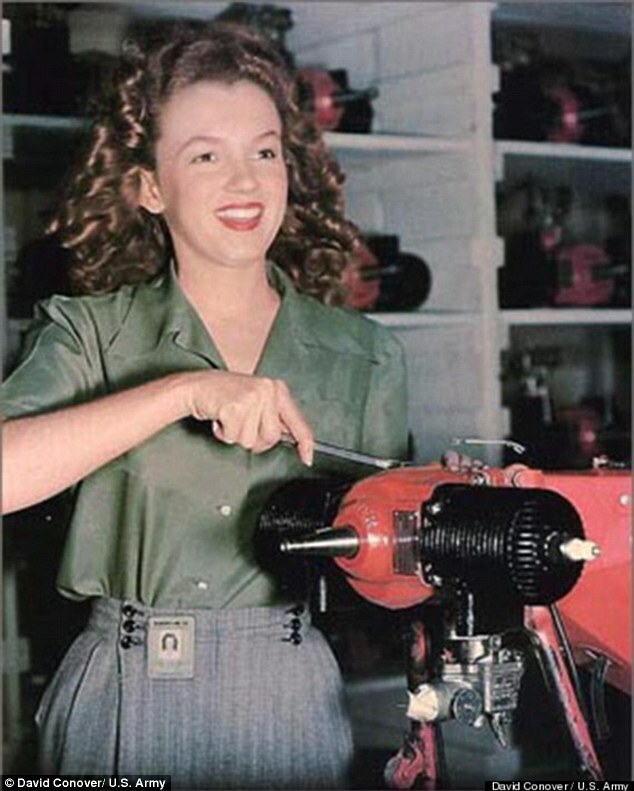 However, for our purposes, Marilyn is just another ordinary factory worker in Burbank. The lady on the top did not become famous and you won't recognize her, but she helped the war effort just like so many other anonymous women workers on the home front. 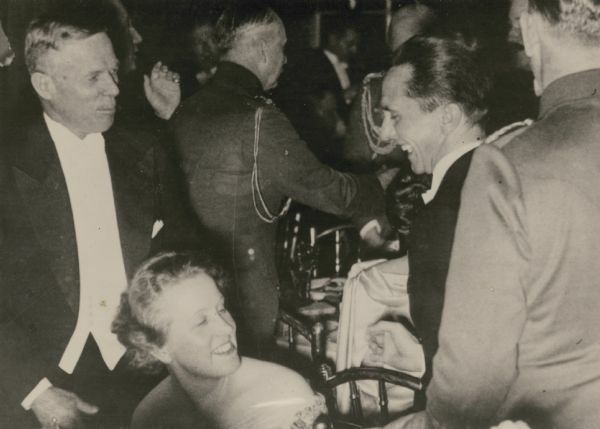 Sigrid Schultz at a party with Joseph Goebbels and William Dodd. Sigrid Schultz was a correspondent for the Chicago Tribune who was hired shortly after World War I. She became the Tribune's chief for Central Europe in 1926. She met Hermann Goering around then when he was still just an itinerant former Great War hero. 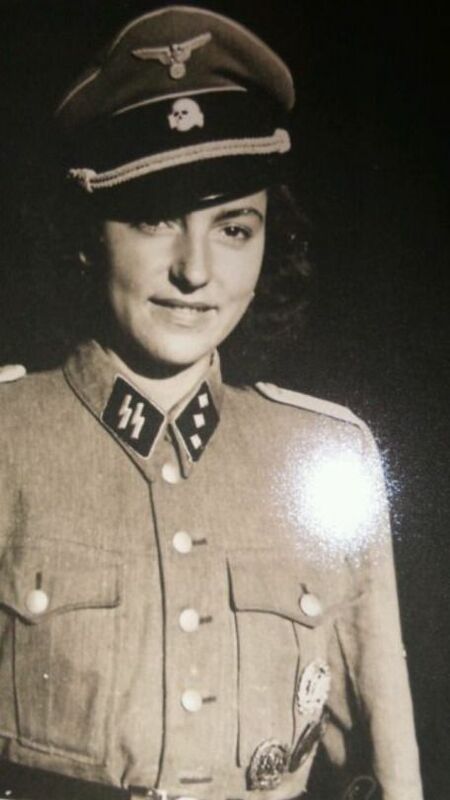 This put her in a unique position to observe the Hitler movement from well before it came to power, and at times he served as her protector (Goering did that for several people of dubious repute in the Third Reich, actually, he was a complex man). Schultz also befriended and helped other top war correspondents such as William L. Shirer. 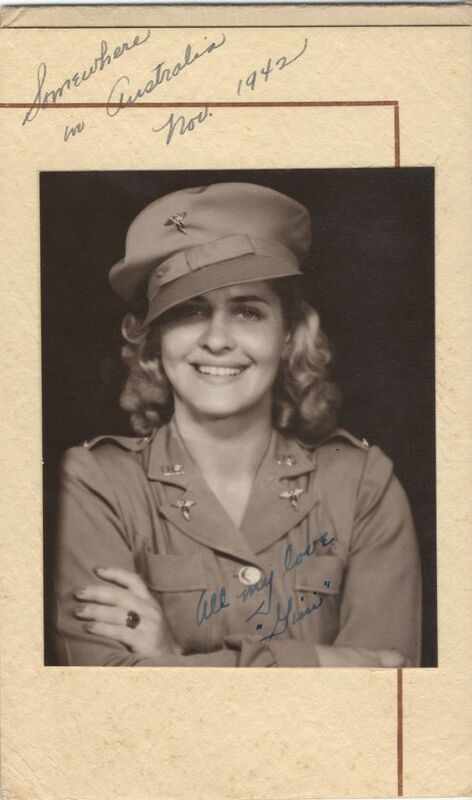 Sigrid was able to handle herself in polite society and most importantly spoke German fluently, so she had access to top government men throughout the pre-war period because they were fascinated by Americans. She wrote under the pseudonym "John Dickson" because people like Joseph Goebbels would not have appreciated her acting as a spy for the US public. 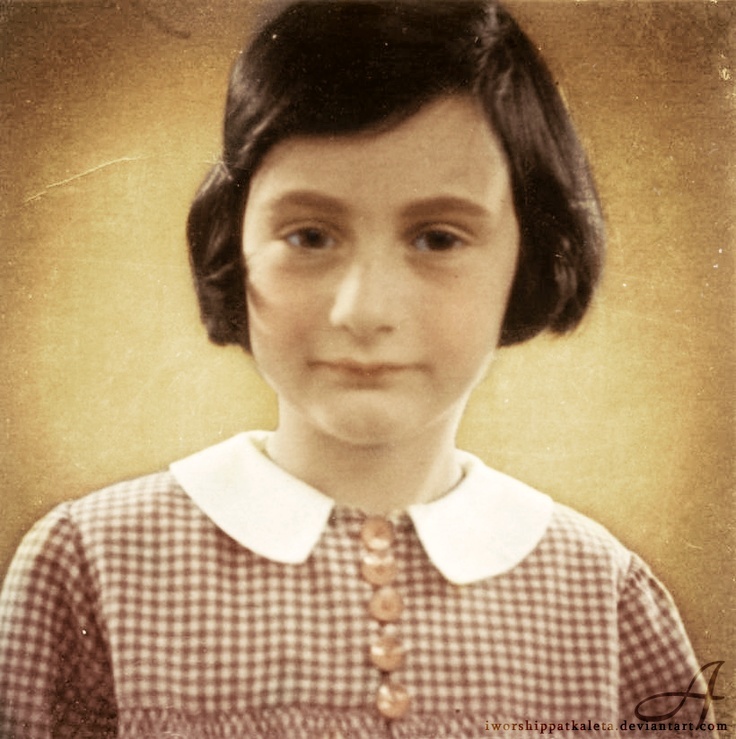 Disguising her despatches to hide her identity, she provided early evidence of unsavory German war practices (most significantly the persecution of Jews) that later would become notorious. After several incidents which read as though they are lifted from a spy novel, having literally risked her life for a long period of time, Sigrid returned to the US in March 1941 when she developed typhus. She only returned to Europe with the D-Day landing forces. Sigrid Schultz then provided valuable reports from the death camps and Nuremberg trials. She passed away in 1980 after writing several books about her experiences. I don't have any information on this Soviet soldier who was in Berlin right after the city's fall in 1945. 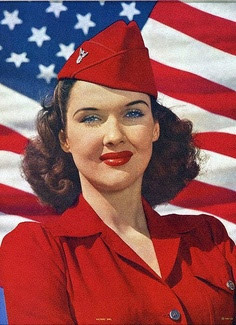 However, like many Red Army ladies, she had the Right Stuff. I have an entire article on Collaborator Girls so I will direct you there for more pictures of them. However, this particular shot stands out to me as showing why so many Wehrmacht men sought out a Paris billet. An SOE agent, Philip Worrall, OBE, on assignment in the Greek mountains. With him are two of his contacts in the field. Women were in the forests, in the cities, in the mountains, providing essential contacts and support. 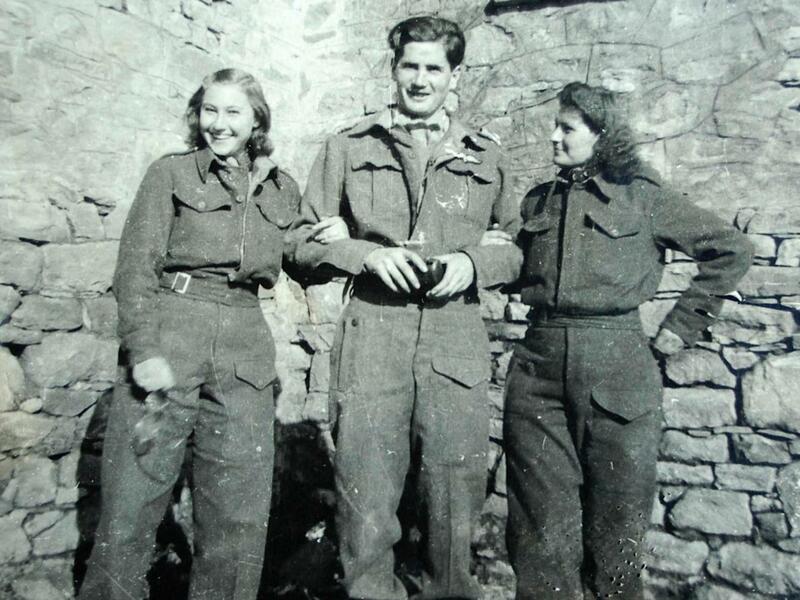 Above, an SOE agent blends in with his friendly female operatives. 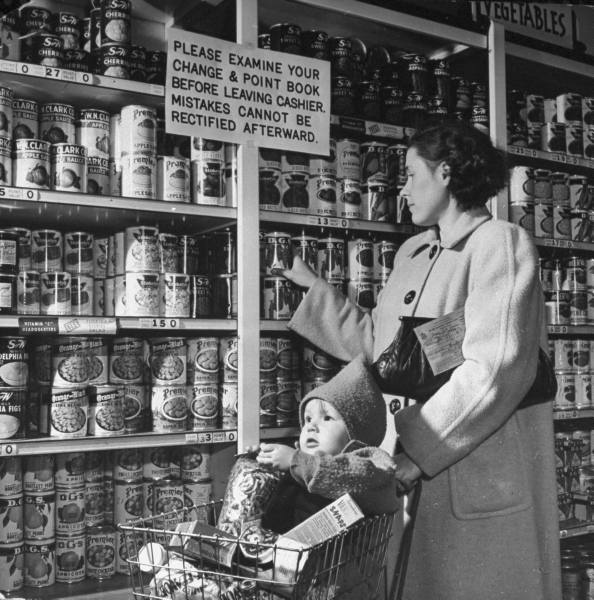 Of course, many women were at home, raising the kids and dealing with ration books, little variety at the store, aging cars they didn't know how to maintain, and massive inconveniences. If their husbands in the military sent home their pay, a soldier's salary didn't go far. There was little news about their men amidst a seemingly endless war. Another BDM girl with a very modern look to her. You could easily picture her in a prep school in the '60s or '70s. Heck, she wouldn't look too out of place now without the BDM regalia. Filmmaker Oren William Haglund was in Pilsen with advancing US troops - who advanced no further - in May 1945 when he shot a couple of minutes of a film featuring a female German refugee. She has become known to students of the war as the "Lost German Girl." 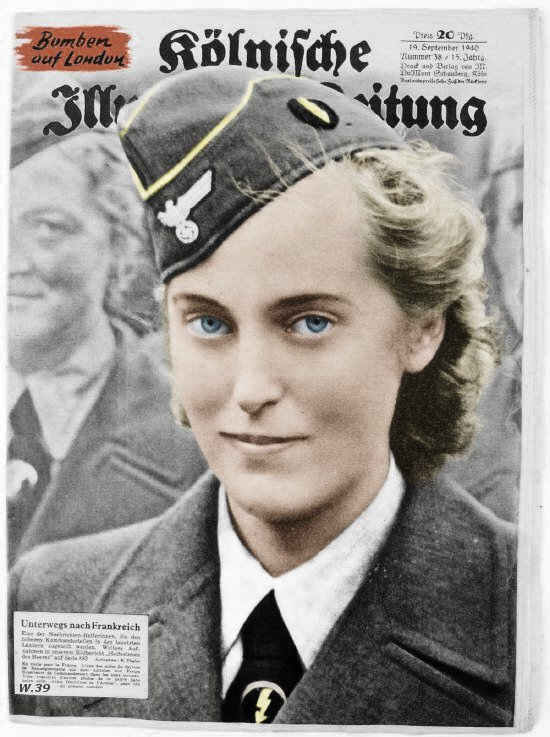 Nobody knows who she was for sure, but there is an unproven claim that she was a BDM girl who volunteered to become a Luftwaffe Helferin and was assigned to Prague. Caught up in the "Czech Hell" of the last days of the war, she was savagely beaten just before Haglund found her (saving her life). He then filmed the clip which eventually made it into the final episode of "The World at War." If the anonymous source is correct, she made it back to Munich and lived a long life; if the source is bogus, her story was probably somewhat similar to that anyway - though it may not have ended as well. In any event, Lost German Girl has come to symbolize the horrors of the end of the war. I appreciate the tips, Raja, I incorporated your suggestions into the copy. I had heard of Sigrid Schultz before, but never really focused on her. I'm glad I did now, her story is well worth telling. Thanks.